We’ll know that SQLite is very powerful, embedded relational database management system and it offers a really amazing set of tools to manage approximately all sorts of data. But when it comes Multi-user applications (where multiple users want to use the same databases), It fails. So It is recommended to choose a fully featured relational database management system rather than SQLite. Some examples of Fully featured RDBMS are MySQL, PostgreSQL, Oracle databases. Django is very flexible in terms of changing databases. So in this article, we’ll see how we can change the database from SQLite to PostgreSQL. Instead of creating everything from scratch, we’re taking the example of our previous article, in which we’re using SQLite database. Open terminal and type these two commands. And follow the instructions mentioned in the link. While installing you have to enter a password and a port number. Note it down. While installing you have to enter a password and a port number. Note it down. Here I am using a Ubuntu 18.04 and I am accessing the PostgreSQL from the terminal, So I have to switch to the user postgres that was created while installing PostgreSQL. Choose the database name that is more relevant to your project. As it is just an example so I am using here myproject. So our user and database are created. 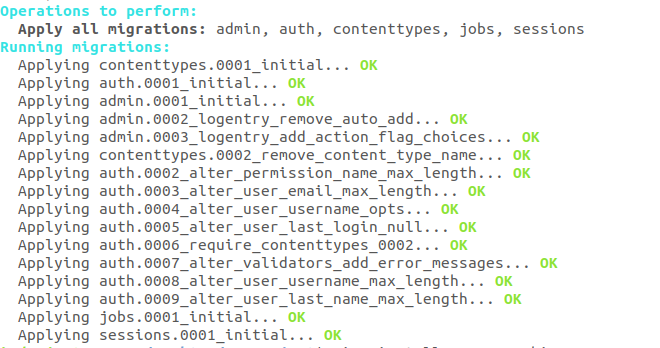 Now just type q to get back to the postgres user’s shell session then type exit. That’s all about database setup. Note: I am using pip3 instead of pip because I have both the versions installed in my Ubuntu Linux. Open your project’s setting file in write mode and go to the DATABASES section. In the above code, NAME, USER, PASSWORD are name of database, name of your user and password that we’ve created while creating the user. And PORT is same number that I recommended to note down while installing the PostgreSQL. So we’ve installed PostgreSQL and configured the settings.py file. Now last step is to migrate your project. All set, test and run your project. That’s all about changing database from SQLite to PostgreSQL. UserWarning: The psycopg2 wheel package will be renamed from release 2.8; in order to keep installing from binary please use “pip install psycopg2-binary” instead. For details see: <http://initd.org/psycopg/docs/install.html#binary-install-from-pypi>. If you’ve any query related to Django PostgreSQL installation and setup, please let us know in the comment box.